Petit fours literally means 'small ovens', a name taken from the historic baking process which led to their creation in France. Typically served at the end of a meal, the petit four is a sweet treat and will typically take the form of a small cake, pastry or sweet. Petits fours offer a wonderful opportunity for small scale innovation, and chefs are becoming increasingly more imaginative with their designs. 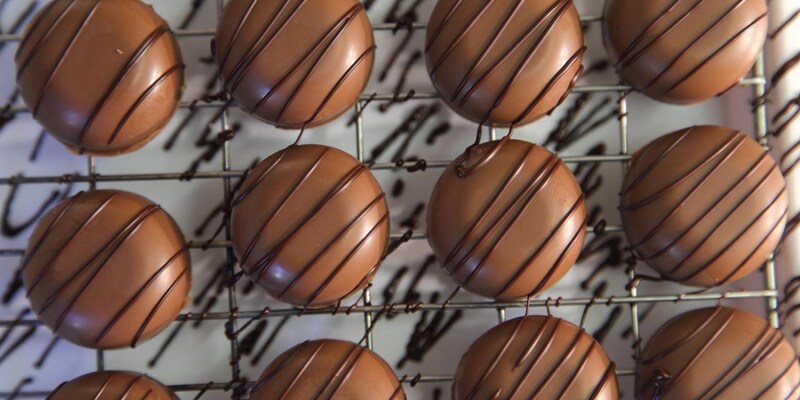 Try some of our creative chocolate petit-fours recipes to delight guests at the end of a dinner party. Renowned chocolatier Paul A Young’s distinctive Port and Stilton truffles will please everyone with their distinctive combination of sweet and savoury flavours. For something more whimsical try creating petits four based on well loved chocolate treats - Marcus Wareing's Jaffa cake recipe is a fantastic take on a nostalgic favourite, while Graham Hornigold pays homage to the familiar honeycomb chocolate bar with his Crunchie macaron recipe.